Purchase this product now and earn 7 Frequent Leaf Points! 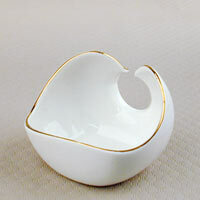 A tea leaf holder made of high-quality porcelain with fine gold brush lining on the edge. 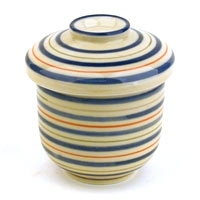 Ideal for holding tea leaves to display for guests. The funnel shape helps pour large tea leaves easily into the small opening of Gongfu teapots. This holder matches our Khurja Teacup and the Porcelain Pouring Pitcher. 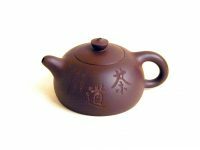 The Gongfu style of brewing is native to Fujian province, China and Taiwan. 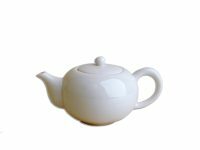 The style encompasses several tea utensils, including a small teapot (usually around 3 to 6 ounces, though some may be larger), and is typically used to brew Oolong or Puer teas. The essence of the Gongfu style is to enjoy tea in a ceremonial setting that highlights the tea preparer’s hospitality. The tea is prepared in small brewing rounds and is poured into a small pitcher, then into individual cups. The process is very engaging and exudes ‘Cha Tao’ – a term used to describe tea spirit. For more on Gongfu brewing, see the video below. Purchase this product now and earn 35 Frequent Leaf Points! Purchase this product now and earn 12 Frequent Leaf Points!